The Beer Café was opened in 2002. It is a family business operated by brothers Gerry and Kevin Febers . We have owned bars in the Merchant City since 1991 when we first bought the Mitre Bar in Brunswick St. When we opened the Beer Café our idea was to let people have an environment where they could drink beer from all beer producing continents, and to allow people to indulge in their favourite holiday beer. Since then we have developed our Beer menu to over 100 different beers, some main stream but many from the craft beer breweries from around the world. We try to promote an environment where people can come to relax, enjoy a drink and converse. To that end we do not play our music loud and only play classic soul, northern soul and blues tunes. While we love our Beer we also supply quality wines and spirits for all tastes, we are not Beer snobs and believe people should always have a choice. So if it's craft beer or session beer, nice wine or quality spirits we cater for all. Our Food is simple but filling; we have a range of quality pies with 10 different fillings but don't sell mutton pies. You can get a flavour from our food menu. We hope you come along and enjoy the unique experience we offer. Pick up tent card at the bar. All our beers are numbered. Every time you buy a beer, have its number stamped. When you have 25 stamps you will receive a T-shirt. Alternatively you can cheat by buying a T-shirt for £8.95. T-shirt sizes and colours are subject to availability. 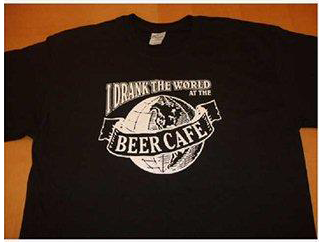 So can you drink the world! Ask at the bar for details, we are happy to help.